I love doing things "themed" with nature, especially in the Spring. Little green shoots and buds have me all excited. I of course wanted it to be something that echoed the essence of Spring. on my computer desk with notes and photos and cards. then I added the little paper butterflies. Just the right amount of Springy-ness. My younger daughter loves to "embellish" and personalize her notes. Victoria Magazine, May 2001 cover. 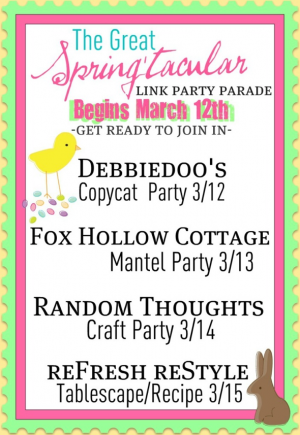 Debbie's kicking off a week of Spring time fun. Be sure and check out the other copy cats at the party. then click here to join in! ends Saturday March 17 at midnight. 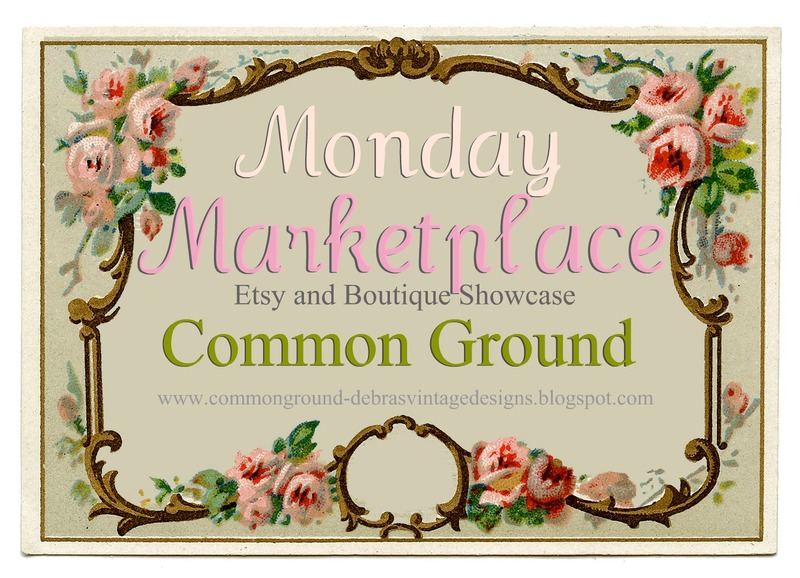 each Monday at Common Ground. this is just beautiful.I love this magazine too!I have that one put away! Your faux-foof is gorgeous. I would kinda like to see it when it's not photo-worthy...just so's I know I'm not the only messy one in the bunch! Love the butterflies, such a fun project. Lost so many of my Victoria mags under the rain soaked tent last summer. Wishing you a lovely Sunday my friend. I will call this week to catch up on what you're up to. I LOVE this, Debra! You nailed it! I love all these different elements from the tags to the butterflies. What a great inspiration picture, too. It's gorgeous Debra...I love Victoria magazine, but I like your version better! Your memo board is gorgeous! I have one in my craft closet that just might have to copy cat you! Love the board Debra, it is beautiful! Beautiful board with those lovely butterflies! Great copy cat! I love this, Debra! They look almost identical! You have a good eye! I love yours so much more! Its beautiful! Oh Debra you are so clever! I love this memo board. SO fun! Thanks for joining in on the copy cat. Enjoy the party. So cute! Your message board is a wonderful copy! That is so very, very pretty! What a wonderful collection of little pretties you have to adorn it with. Happy Spring! Love the copy cat. Your colours and display are more suttle. What an amazing copy! I love it. It fits in so well with the season too. That looks like something you spent alot of money on. I like how you used things that were sentimental too. What a beautiful job. I'd love to have you join me at Seasonal Sundays. It is so pretty!!! It looks better than the one on the magazine! You did a wonderful job with your copy cat challenge Debra. It's beautiful! Debra, I love it that you used an older issue for your copy cat challenge. Truly pretty things never go out of style!!! Your French message board with the butterfly pins is inspiring. I love your entry! Your copycat project is really beautiful! It looks better than the original! Lovely message board! Victoria Magazine is still a great source of inspiration, here, also! Here's wishing you a wonderful week ahead! Oh this is beautiful, Debra! You really captured the inspiration photo and added your own wonderful personal touches! The butterflies really are perfect for spring! I really like this and I would love to make one. Do you now where I might be able to find a good tutorial to make a message board like this? I love this! I'm on an iPad and for some reason the linky for Monday Marketplace isn't showing. I'll be back later to link up. Thanks again! Victoria magazine has always been one of my favorites! I love how your bulletin board turned out...very beautiful job!! I love it Debra! the butterflies give it a cute dimension. Your daughter's note is so sweet. Now days most notes come by way of a text. It will be priceless. At least to mom. So pretty! I love it thanks for sharing. I'm visiting from Primp Your Stuff. I love your message board. It is lovely! I am following you now.